These beautiful teacups made by Swedish artist Cecilia Levy are not only beautiful to look at but also light on the environment! Made from recycled book pages, each cup and saucer is a unique piece of art that you certainly wouldn’t want to pour your coffee in. After receiving an MFA in graphic design and teaching at the College of Arts and Crafts in Gothenburg, Levy decided to really get to know her medium by taking bookbinding classes. Working intensively with her hands, she realized books could be pieces of art too – read on for a look at her incredible work! Levy is now a member of the arts and crafts collective Kaleido in Uppsala where she regularly sells her tea cups along with a selection of other paper sculptures and drawings using various pieces of recycled books and bindings. She also holds regular workshops in her hometown and travels throughout Sweden teaching bookbinding to students of all ages. 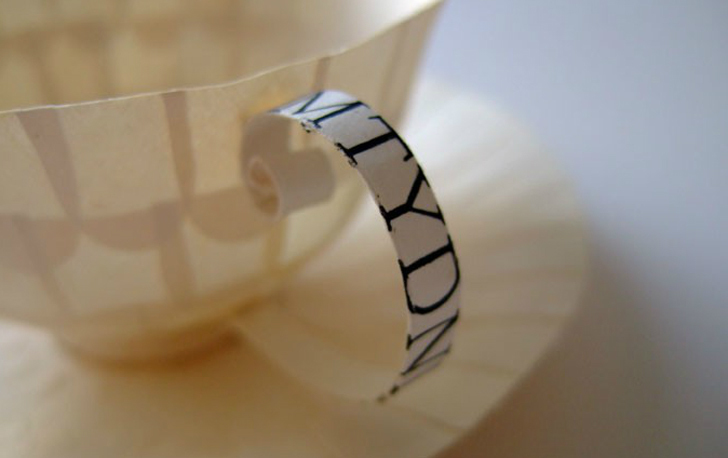 Though she has exhibited and sold her work extensively throughout her own country, we would love to get our hands on these pretty little tea cups in the US! These beautiful teacups made by Swedish artist Cecilia Levy are not only beautiful to look at but also light on the environment! 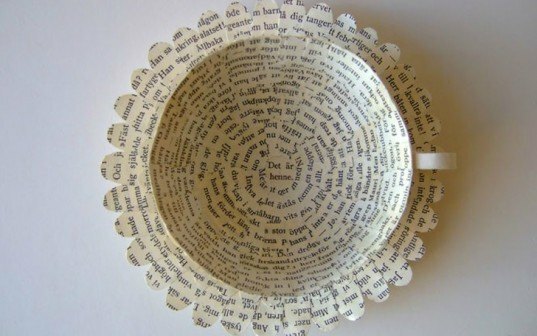 Made from recycled book pages, each cup and saucer is a unique piece of art that you certainly wouldn't want to pour your coffee in. After receiving an MFA in graphic design and teaching at the College of Arts and Crafts in Gothenburg, Levy decided to really get to know her medium by taking bookbinding classes. Working intensively with her hands, she realized books could be pieces of art too - read on for a look at her incredible work!